On April 11, 2012, at 15:38 local time, a huge undersea earthquake occurred at the west of the Indonesian island of Sumatra. Two hours later, an 8.2-magnitude aftershock started. Initially, authorities feared that the earthquake would cause a tsunami and warnings were issued across the Indian Ocean; however, these warnings were subsequently canceled. It was the largest strike-slip earthquake ever recorded, in which two parts of the Earth’s crust slide past each other horizontally. Despite it was a huge earthquake, it occurred very remote from an inhabited place and produced no destructive tsunami (10 cm to 0.8 meter / 3.9 inches to 31.4 inches tsunamis were reported). 10 deaths and 12 injuries were reported – most of them caused by panic and/or heart attack. A child was critically injured by a falling tree. Some people used cars and motorcycles to reach higher ground and accidents occurred. Casualties: between 1,500 and 3,300 people were killed. Thousands of people injured. On August 15, 1950, a massive earthquake occurred at Eastern Xizang-India border region, and the epicenter was located near Rima, Tibet. It is known as 1950 Assam–Tibet earthquake, or simply the Assam earthquake. It was destructive in both Assam (a state in northeastern India known for its wildlife, archaeological sites, and tea plantations) and Tibet, many buildings were destroyed and between 1,500 and 3,300 people were killed. After the earthquake, large landslides blocked the Subansiri River. This natural dam broke 8 days later, creating a wave of 7 m (23 ft) high which inundated several villages and killed 536 people. The earthquake also created around 5,000,000 homeless. It was caused by two continental plates colliding – the largest known earthquake to have not been caused by an oceanic subduction. The 1965 Rat Islands Earthquake occurred at 05:01 UTC, on February 4 (19:01, February 3, in local time). It triggered a tsunami of over 10 meters (33 feet) on Shemya Island, Alaska, but thanks to its distant location, caused very little damage. The 1906 Ecuador–Colombia earthquake occurred at 15:36 UTC on January 31, off the coast of Ecuador, near Esmeraldas (a coastal city in northwestern Ecuador). It produced large tsunamis (up to 5 meters/16 feet high), which is the cause of the deaths. A destroyed building in Concepción, Chile after the 2010 Chile earthquake. 2010 Maule Earthquake, also known as the 2010 Chile earthquake has occurred off the coast of central Chile on Saturday, 27 February at 03:34 local time (06:34 UTC) about 3 km (1.9 miles) off the coast of Pelluhue commune in the Maule Region, Chile. The intense shaking lasted for about three minutes. Several coastal towns in south-central Chile were devastated by the tsunami triggered by the earthquake. The tsunami also damaged the port at Talcahuano. Buildings collapsed in many cities, including the capital, Santiago, causing many deaths. The authorities announced the final death toll of 525 victims and 25 people missing in January 2011. On November 4, 1952, at 16:58 GMT (04:58 local time) a huge earthquake struck off the coast of the Kamchatka Peninsula, in the far east of Russia. It produced a great destructive Pacific-wide tsunami with waves up to 15 meters (50 feet) which caused extensive damage to the Kamchatka Peninsula and the Kuril Islands, left an estimated 10,000 to 15,000 people dead. It was also very damaging in the Hawaiian Islands, but there were no human deaths attributed to the tsunami. The waves traveled as far as Peru, Chile and New Zealand. In Alaska, the Aleutian Islands and California, tsunami waves of up to 1.4 meters (4.6 feet) were observed. On 11 March 2011 Friday, at 14:46 with the local time (05:46 UTC), a massive undersea megathrust earthquakenotes 1 off the coast of Japan occurred. The earthquake triggered a massive tsunami with waves up to 40.5 meters (133 feet) high. 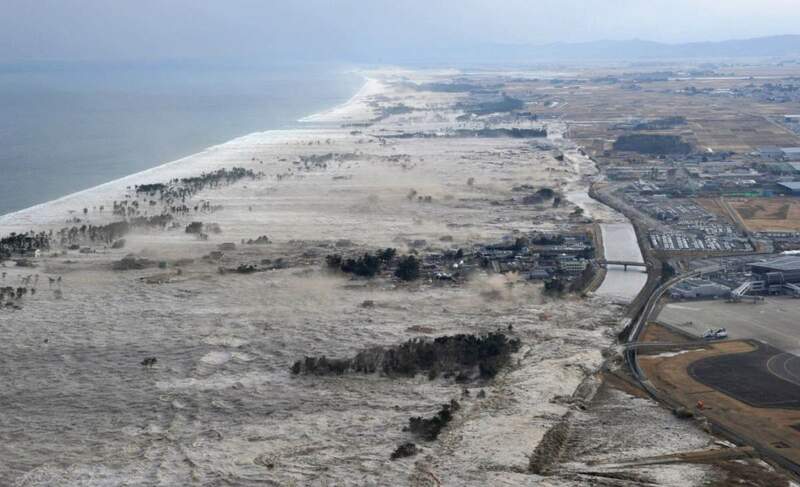 It was one of the deadliest in human history, the waves traveled inland as far as 6 miles (10 km) and caused extensive and severe structural damage in north-eastern Japan. Airports, roads and railroads destroyed, 127,290 buildings totally collapsed, 272,788 buildings half collapsed, and another 747,989 buildings partially damaged. A dam collapsed. The tsunami also caused nuclear accidents, primarily the level 7 meltdowns (means a Major accident, highest level, see notes 2) at three reactors in the Fukushima Daiichi Nuclear Power Plant complex. On 10 March 2015, it was announced that the confirmed casualties were 15,894 deaths, 6,152 injured, and 2,562 people missing. 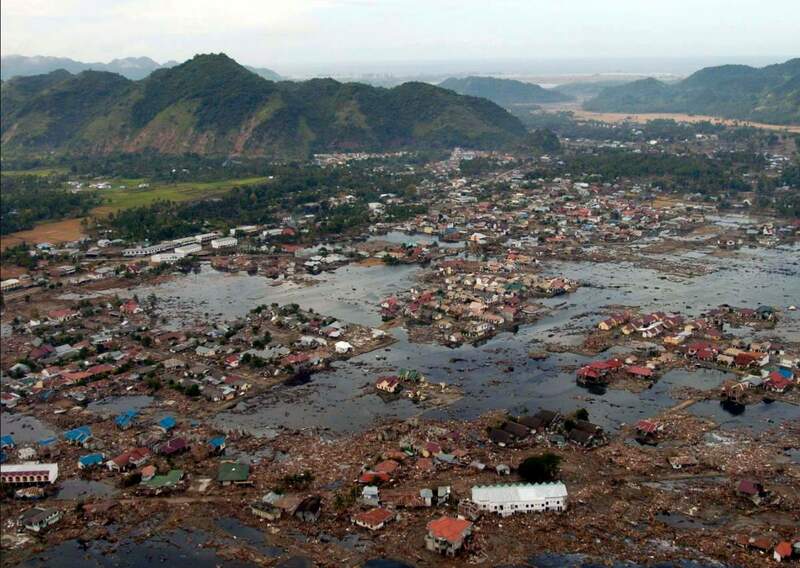 Indian Ocean (Jan. 2, 2005) – A village near the coast of Sumatra lays in ruin after the Tsunami that struck South East Asia. Helicopters assigned to Carrier Air Wing Two (CVW-2) and Sailors from USS Abraham Lincoln (CVN 72) are conducting humanitarian operations in the wake of the Tsunami that struck South East Asia. The Abraham Lincoln Carrier Strike Group is currently operating in the Indian Ocean off the waters of Indonesia and Thailand. (South-West suburb of Banda Aceh, Indonesia. The village of Lampisang is visible in the upper-right corner) U.S. Navy photo by Photographer’s Mate 2nd Class Philip A. McDaniel (RELEASED). This Image was released by the United States Navy with the ID 050102-N-9593M-040. One of the deadliest natural disasters in recent history, the 2004 Sumatra Earthquake, also known as the 2004 Indian Ocean earthquake, occurred at 00:58:53 UTC on 26 December with the epicenter off the west coast of Sumatra, Indonesia. It ruptured the greatest fault length of any recorded earthquake, spanning a distance of 1500 km (900 miles). The resulting tsunami, with waves up to 30 meters (100 ft) high, caused up to a quarter of a million deaths. The earthquake had also the longest duration of faulting ever observed, between 8.3 and 10 minutes. It caused the entire planet to vibrate as much as 1 centimeter (0.4 inches). Total energy released by the quake was 4.0×1022 joules (4.0×1029 ergs), or 9,600 gigatons of TNT, 550 million times that of Hiroshima atomic bomb. The vast majority of this energy was underground. The energy released on the Earth’s surface was estimated at 1.1×1017 joules or 26 megatons of TNT. This energy is equivalent to over 1,500 times that of the Hiroshima atomic bomb, but less than that of Tsar Bomba, the largest nuclear weapon ever detonated. The resulting tsunami was given various names, including the 2004 Indian Ocean tsunami, South Asian tsunami, Indonesian tsunami, the Christmas tsunami (there were also hundreds of thousands of Christian tourists in the areas affected by the tsunami), and the Boxing Day tsunami. 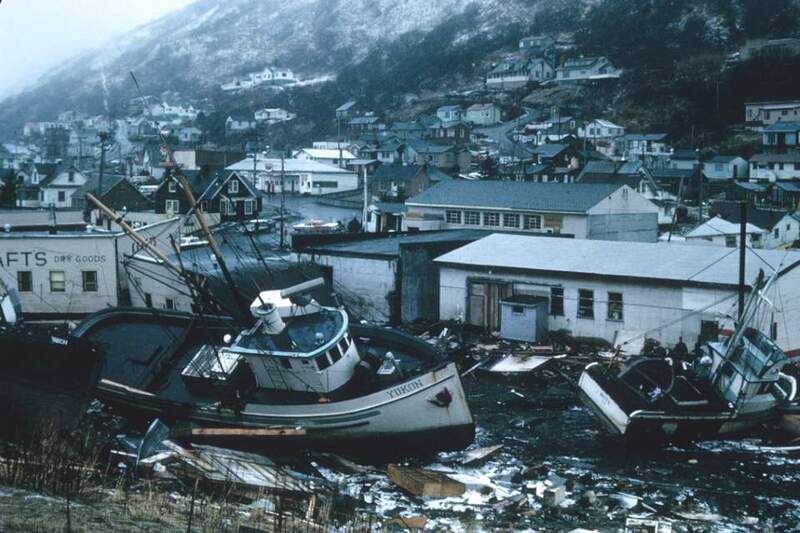 The 1964 Great Alaska earthquake (also known as Good Friday earthquake) occurred at 5:36 PM (local time, 3:36 UTC) on Good Friday, March 27 in the Prince William Sound region of Alaska. It lasted approximately 4.5 minutes and is the most powerful recorded earthquake in U.S. history. The earthquake triggered 27-foot (8.2 meters) tsunami which destroyed the village of Chenega, killing 23 of the 68 people who lived there. Survivors out-ran the wave, climbing to high ground. It also caused a massive underwater landslide. Port Valdez city harbor and docks were collapsed, 30 people perished. A total of 139 people are believed to have died: 15 as a result of the earthquake itself, 106 from the subsequent tsunami in Alaska, 5 from the tsunami in Oregon, and 13 from the tsunami in California. Also known as the Great Chilean earthquake (Spanish: Gran terremoto de Chile), it was the most powerful earthquake ever recorded. The earthquake hit on May 22 in the afternoon (19:11 GMT, 15:11 local time), approximately 100 miles (160 km) off the coast of Chile, parallel to the city of Valdivia. It lasted approximately 10 minutes and triggered a massive tsunami with waves up to 25 meters (82 feet). The main tsunami severely battered the Chilean coast, and raced across the Pacific Ocean and devastated Hilo, Hawaii. Waves as high as 10.7 meters (35 feet) were recorded even 10,000 kilometers (6,200 mi) from the epicenter, and as far away as Japan and the Philippines. The death toll of 1960 Valdivia Earthquake is not certain – the total number of fatalities from the earthquake and tsunamis have been estimated between 1,000 and 6,000. About 3,000 people were injured. Recalling 1960 Chile Earthquake – the biggest earthquake in recorded history. The moment magnitude scale (abbreviated as MMS; denoted as Mw or M) is used by seismologists to measure the size of earthquakes in terms of the energy released. The scale was developed in the 1970s to succeed the 1930s-era Richter magnitude scale (ML). Even though the formulae are different, the new scale retains a similar continuum of magnitude values to that defined by the older one. As with the Richter magnitude scale, an increase of one step on this logarithmic scale corresponds to a 101.5 (about 32) times increase in the amount of energy released, and an increase of two steps corresponds to a 103 (1,000) times increase in energy. Thus, an earthquake of Mw of 7.0 releases about 32 times as much energy as one of 6.0 and 1,000 times that of 5.0. The magnitude is based on the seismic moment of the earthquake, which is equal to the rigidity of the Earth multiplied by the average amount of slip on the fault and the size of the area that slipped. Since January 2002, the MMS has been the scale used by the United States Geological Survey to calculate and report magnitudes for all modern large earthquakes. Developed in the 1930s by seismologists Charles Francis Richter (April 26, 1900 – September 30, 1985) and Beno Gutenberg (June 4, 1889 – January 25, 1960) of the California Institute of Technology, the Richter magnitude scale (also Richter scale) assigns a magnitude number to quantify the size of an earthquake. It is a base-10 logarithmic scale: as measured with a seismometer, an earthquake that registers 5.0 on the Richter scale has a shaking amplitude 10 times greater than an earthquake that registered 4.0 at the same distance. The intensity of an earthquake will typically measure between 2 and 10 on the Richter scale. Any earthquakes registering below a 5.5 are fairly minor; they may shake the ground a bit, but are seldom strong enough to cause much damage. Earthquakes with a Richter rating of between 5.5 and 7.9 are much more severe, and any quake above an 8 is likely to cause massive damage. Less than 3.5: Generally not felt, but recorded. 3.5 – 5.4: Often felt, but rarely causes damage. 5.5 – 6.0: At most slight damage to well-designed buildings, but can cause major damage to poorly constructed buildings. 6.1 – 6.9: Can be destructive in areas up to about 100 kilometers across where people live. 7.0 – 7.9: Major earthquake. Can cause serious damage over larger areas. 8 or greater: Great Earthquake. Can cause serious damage in areas several hundred kilometers across. It has occurred on January 12, 2010. The magnitude was 7.0Mw. An estimated three million people were affected by the quake with a death toll of around 160,000. The 856 Damghan earthquake occurred on 22 December, 856 AD with an estimated magnitude of 7.9. The epicenter was close to the city of Damghan, then the capital of the Persian province of Qumis, Abbasid Caliphate (now Iran). The death toll was around 200,000 with around 45,000 casualties in Damghan alone. The 1303 Hongdong earthquake occurred on September 25 in China (then part of the Mongol Empire). In the nearby towns of Zhaocheng and Hongdong, every major temple and school building collapsed and over half the towns’ populations perished. In Huo county, Shanxi, every building was destroyed. In Taiyuan and Pingyang, nearly 100,000 houses collapsed. The 1780 Tabriz (Iran) earthquake occurred on the night of Friday to Saturday 8 January 1780. It almost totally destroyed the city and devastated about 400 villages, including Marand, Tasuj, and Iranaq (a village in Shebli Rural District, in the Central District of Bostanabad County, East Azerbaijan Province, Iran). The magnitude of the earthquake was Ms=7.7. In Tabriz itself, all major buildings, weakened by previous shocks, were ruined and all private houses, as well as the fort and walls of the city, were totally destroyed. The 1138 Aleppo earthquake occurred on 11 October 1138. Aleppo, in Northern Syria, was a large city of several tens of thousands during this period. A contemporary chronicler in Damascus, Ibn al-Qalanisi (circa 1071 – March 18, 1160), recorded the main quake. According to him, The residents of Aleppo had been warned by the foreshocks and fled to the countryside before the main quake. Despite this, the death toll was high. The castle of Harem, where Crusaders had built a large citadel, was destroyed and the church fell in on itself. The fort of Atharib, then occupied by Muslims, was destroyed. The citadel also collapsed, killing 600 of the castle guard. In Aleppo, the walls of the citadel collapsed, as did the walls east and west of the citadel. Numerous houses were destroyed. Further damage is recorded at Azrab, Bizaah, Tell Khalid and Tell Amar. It occurred on 13 December 115 AD with an estimated magnitude of 7.5. A great number of people died in the Roman city of Antioch, today Antakya in Hatay province in Turkey, and surrounding areas. Roman statesman and historian of Greek origin, Cassius Dio was there at that time. According to him, the earthquake began with a loud roaring sound, followed by intense shaking of the ground. Whole trees were thrown into the air, as were many of the inhabitants, causing great injury. Large numbers of people were killed by falling debris, while many others were trapped. The Roman Emperor Trajan (18 September 53 – 8 August 117 AD) was wintering in the city at that time, so Antioch was crowded with soldiers and many civilians that had traveled from all parts of the empire. The emperor himself also was caught in the earthquake, as was his successor Hadrian (24 January 76 – 10 July 138). They escaped with only slight injuries and later began a program to rebuild the city. The earthquake also triggered a local tsunami that badly damaged the harbor of Caesarea (a town in north-central Israel). The 526 Antioch earthquake hit Syria (region) and Antioch in the Byzantine Empire. It struck during late May, probably between May 20–29, at mid-morning, causing severe damage to many of the buildings in Antioch and killing approximately 250,000-300,000 people. It has been suggested that the very high number of casualties was a result of there being a large number of visitors in the city from the surrounding countryside, there to celebrate Ascension Day. 1920 Haiyuan earthquake, also known as 1920 Gansu earthquake occurred on December 16 in Haiyuan County, Ningxia Province, Republic of China. It hit at 20:05:53 Beijing time (12:05:53 UTC), reportedly 7.8 on the Richter magnitude scale. It was felt as far away as Norway. Occurring in the early years of escalating civil war in the Chinese Republic, the disaster was overshadowed by major political and humanitarian crises elsewhere in the country that year, and remains a remarkably little-known event despite the scale of its destructive powers and human toll. Witnesses noted that buildings in the nearby provincial capital of Lanzhou were surprisingly resilient under the stress of the quake and the ensuing months of aftershocks, while the vast majority of destruction occurred in rural areas abutting the epicenter that consisted largely of cave dwelling communities, such as Haiyuan and Guyuan especially. Based on county reports from 50 (and in some cases 53) counties, the estimates of total human deaths due to the earthquake ranged from 234,117 to 314,092. The Great Tangshan earthquake occurred on July 28, 1976. The epicenter of the earthquake was near Tangshan in Hebei, People’s Republic of China, an industrial city with approximately one million inhabitants. The magnitude was 7.8Mw. The number of deaths announced as 240,000-255,000 by the Chinese government. But the estimated death toll is as high as 655,000. A further 164,000 people were recorded as being severely injured. The 1556 Shaanxi earthquake, also known as the Jiajing Great earthquake is not only the deadliest earthquake ever happened, it is also considered as the third deadliest disaster of all time (after 1931 China floods and 1887 Yellow River flood). It occurred on the morning of 23 January 1556 in Shaanxi, Northern China, during the Ming Dynasty. The magnitude was first estimated approximately 8.0 to 8.3 on the Richter Magnitude Scale, though more recent discoveries have shown that it was more likely 7.9. Though the quake lasted only seconds, it leveled mountains, altered the path of rivers, caused massive flooding, and ignited fires that burned for days. An 840-kilometer-wide (520 mi) area was destroyed, and in some counties, as much as 60% of the population was killed. In the cities, many of the casualties were people who had been crushed by collapsing stone buildings. Thus, in the aftermath of the earthquake, many of the stone buildings that had been destroyed were replaced with buildings made of softer, more earthquake-resistant materials, such as bamboo and wood. Another major contributing factor to the horrific death toll was the artificial caves called Yaodongs, which were built into the side of cliffs. At that time, millions of people were living in them. The earthquake caused landslides, which destroyed the caves and killing many people. Portuguese Dominican friar Gaspar da Cruz (circa 1520 – 5 February 1570), who traveled to Asia and wrote one of the first detailed European accounts about China, visited Guangzhou later in 1556. He heard about the earthquake and listened to the stories from people, and later reported about it in the last chapter of his book, A Treatise of China (1569). He viewed the earthquake as a possible punishment for people’s sins. Megathrust earthquakes are the most powerful earthquakes on Earth: teir moment magnitudes (Mw) that can exceed 9.0 – no other type of earthquakes has reached that magnitude so far. Megathrust earthquakes occur at subduction zones at destructive convergent plate boundaries, where one tectonic plate is forced underneath another. Level 4: Accident with local consequences. Level 5: Accident with wider consequences. Example: Three Mile Island accident near Harrisburg, Pennsylvania (United States), March 28, 1979. Level 6: Serious accident. Example: Kyshtym disaster at Mayak Chemical Combine (MCC) the Soviet Union, 29 September 1957. Level 7: Major accident. Examples: Chernobyl disaster, 26 April 1986. Fukushima Daiichi nuclear disaster, a series of events beginning on 11 March 2011. A month later the Japanese government’s nuclear safety agency rated it level 7.